This Rope and Can Bird Feeder is one of the easiest crafts out there - even your kids could help create it. 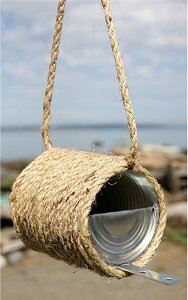 Use an old tin can and some rope to make this eco-friendly DIY bird feeder. In 20 minutes, you'll have a fantastic bird feeder to hang from your house, garage, or anywhere outside you'd like. You and your family will have fun watching all the different types of birds come and go all spring long. Take the tin can lid and bend it in half. Take the metal for the post and glue it down so that there is enough room for the birds to perch while they eat. Insert your can lid so that it fits nicely over the metal piece you just glued in and is just inside the opening of the can and glue into place making sure there are no openings for the seed to fall through. Find the top middle of the can and glue a long piece of sisal rope (about 2.5 ft) from top to bottom of the can so that you have 1 ft on either side of the can hanging off (you’ll tie this together at the end) - this will be the part that hangs from the hook or tree. Now, starting at the top of the can, slowly glue down the sisal rope from one end to the other by going around the can in a circular motion until you reach the bottom of the can. Cut the rope and glue in ends. Cut a piece of rope the exact size of the front of the can and glue on around the top/front edge to help give a nicer finished look to the feeder. Tie the two 1 foot piece ends that are still hanging to the sides together in a knot. Fill with bird seed and hang from a hook or tree. 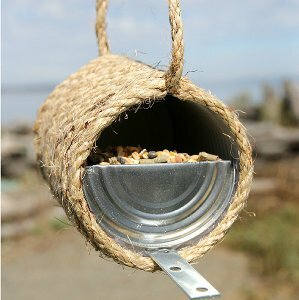 This Rope and Can Feeder is a great idea to add some neat looking feeders in your garden or around your yard and so easy to make with things yoy probably have laying around but I would make sure there are no sharp ends on the can. I would try and maybe add some rope on the lid to or find a different type of pech. This is a cute idea for a gift for that bird loving person like me and a great way to recycle those cans. Thanks for great and cool idea. Use a pair of pliers to flatten any sharp ends. Bend cut top of can exactly in half and use pliers to flatten the crease. If you are not using a large tomato can, you can wrap the rope around the can before gluing to make sure you cut the right length. Then carefully glue the rope to the can. The perch is just a straight bracket. You can look around for any scrap piece of metal. I'd give it a clear layer of enamel to keep it from rusting or use spray paint in a rustic color. Cute idea to hang several places in the garden. I'm a landscaper and I will make several of these this winter and hang in my customer's landscaping. THis looks like a really fun craft. Definitely a cool way to keep that rustic/vintage vibe. Save time step 3. Use a can with a PULL TAB LID. Fold lid in have keep tab on and use as the PERCH.